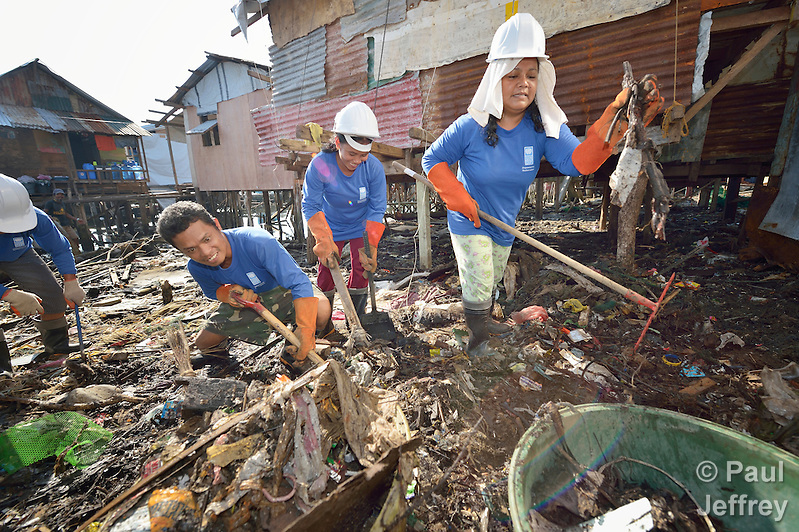 Tacloban was ground zero for last November’s typhoon in the Philippines. Although its residents have been hard at work cleaning up the mess the super storm left behind, a walk along the city’s ravaged waterfront is still a powerful emotional experience. As I picked my way through the rubble on Valentine’s Day in February, there was another emotion afoot. 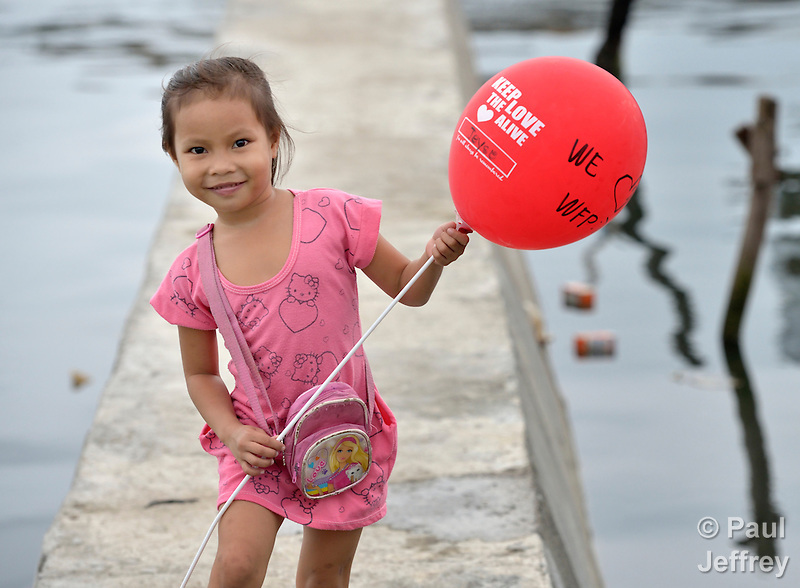 Survivors had blown up thousands of red and white balloons with the slogan “Keep the love alive” and the handwritten name of one of the UN agencies or NGOs working there. The main street was lined with hundreds of people holding balloons, and just about everyone I met smiled and wished me “Happy Valentine’s Day.” Among them was Oscar Mabini, a grizzled old man holding a balloon and a photo of his daughter Cristina, who died in the storm along with two of her children. I talked with him for a while, and like everyone else I met there, he repeatedly voiced his appreciation for the way the world has helped. 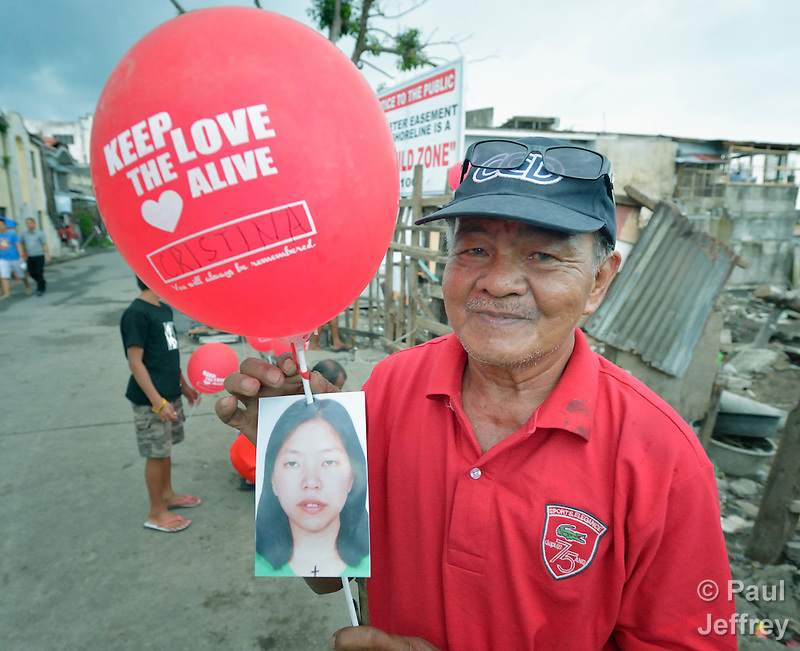 My encounter amid the balloons with Oscar underscored two powerful themes that struck me over and over in the Philippines. 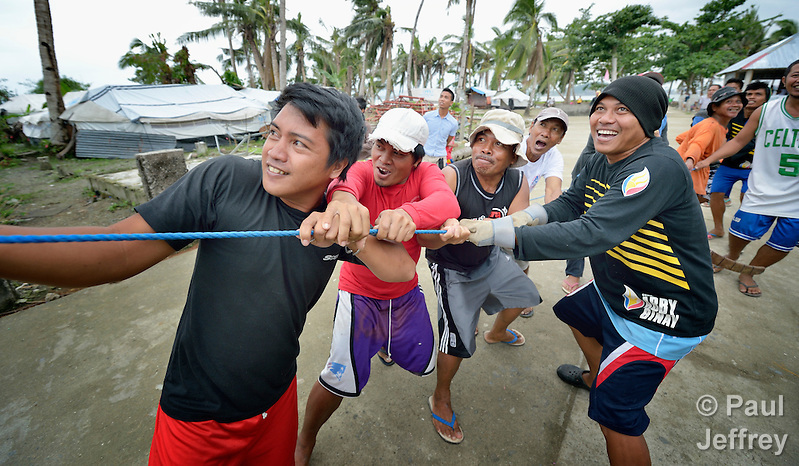 First of all is the resilient nature of Filipinos and Filipinas to work hard to be survivors, and not simply victims. This is witnessed in the concrete solidarity they displayed to each other, particularly during the several days it took the relief community to crank up a response, and the sense of community I found everywhere. I didn’t find individuals rebuilding, but rather communities engaged in repairing the damage from a storm that, while it caused severe damage to the physical infrastructure, did not unravel the social fabric that binds communities together. 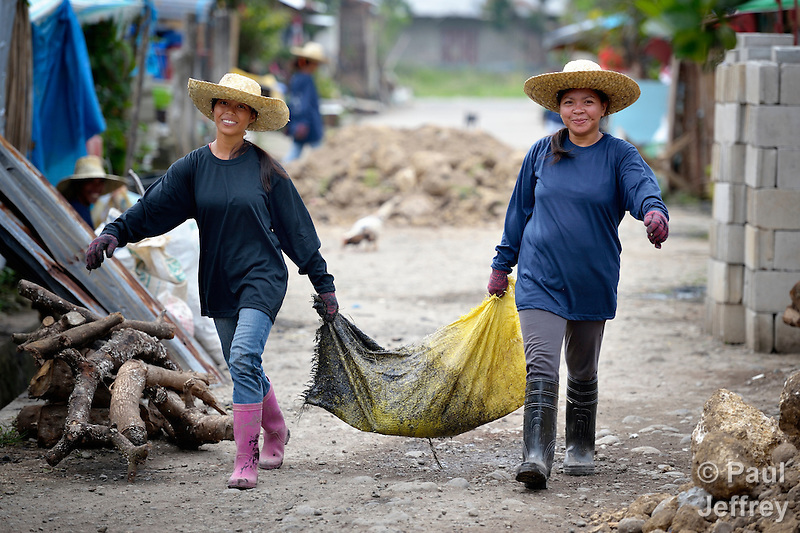 Secondly, people in areas ravaged by Typhoon Haiyan–known locally as Yolanda–have manifested incredible grace toward those whose solidarity has helped in some way. Both to me are a gift. We tend to look at disasters as settings where all the emotional energy flows one way, from the emergency worker to the victim. But when people stubbornly refuse to be victims, that hierarchy quickly breaks down, liberating the aid worker/emergency responder from any illusions that they are God come to save someone. Instead, they come to accompany those who have passed through incredible trauma. Being an accompanier rather than a rescuer is much more fun. Sure, there is still work to be done, water to purify, rubble to clear, and wounded to heal, but shrugging off the mantle of rescuer allows one to see how survivors rescue themselves. It even allows us to begin to hear the magical rhythms of children playing amid the rubble. I learned something about that from Stephanie Fortaleza, a 4-year old girl I met in Ormoc, another town in Leyte province. 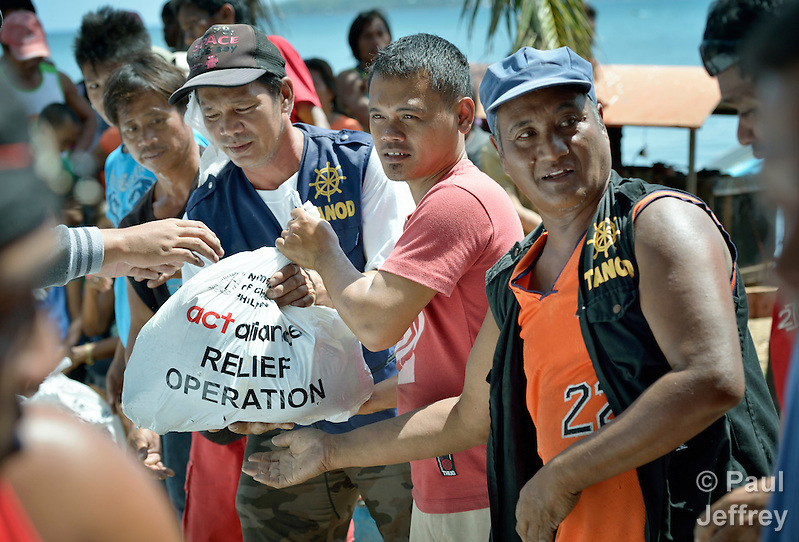 I was there because Lutheran World Relief, a member of the ACT Alliance that I was representing, was helping folks in Ormoc with a cash-for-work program. That’s a fast way to get cash circulating in an affected community by paying people to repair their community’s damaged infrastructure. I was taking pictures of people involved in that program, mostly cleaning up rubble and clearing waterways and drainage ditches, when I heard some pounding. My tiny photographer’s brain, which is constantly scanning incoming data for anything that might suggest the proximity of a decent image, announced to me that someone must be using a hammer to straighten rusty tin roofing sheets. That seemed worth pursuing, so I started wandering toward the sound. When I finally turned a corner on some rubble, here was Stephanie making music by beating on sheets of rusty tin roofing that were piled up in her family’s yard. She was unfazed by the sudden appearance of a sweaty foreigner, and didn’t miss a beat. So I not only photographed her, but also switched on a microphone and recorded some of her symphony. For me it set the tone for what I was seeing almost everywhere, so I used it to start off a short video I produced for the ACT Alliance. Stephanie’s rhythms were just part of the universe of sounds and feelings, of course. A counterpoint was the silence of family members keeping vigil over the still fresh graves of their loved ones. 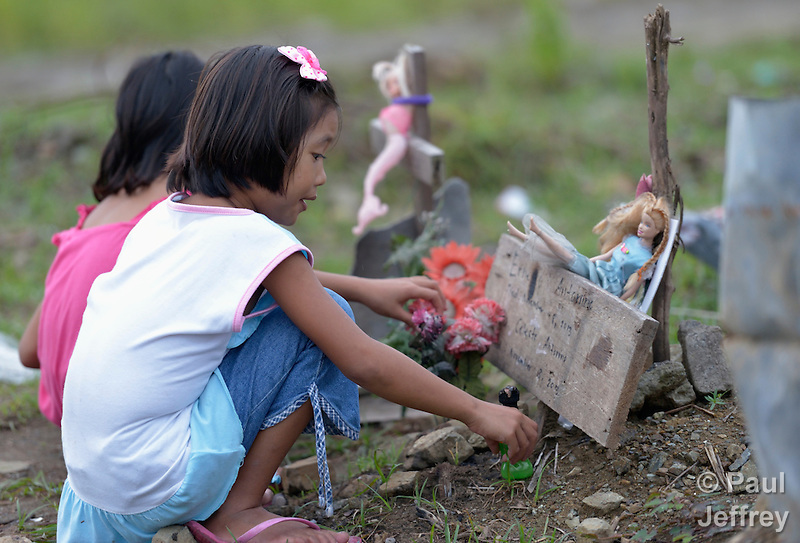 The graves of children, with toys and dolls to keep them company, were especially poignant, a reminder that no matter how strong our community, no matter how resilient our organization, the poor and weak are still vulnerable and suffer. 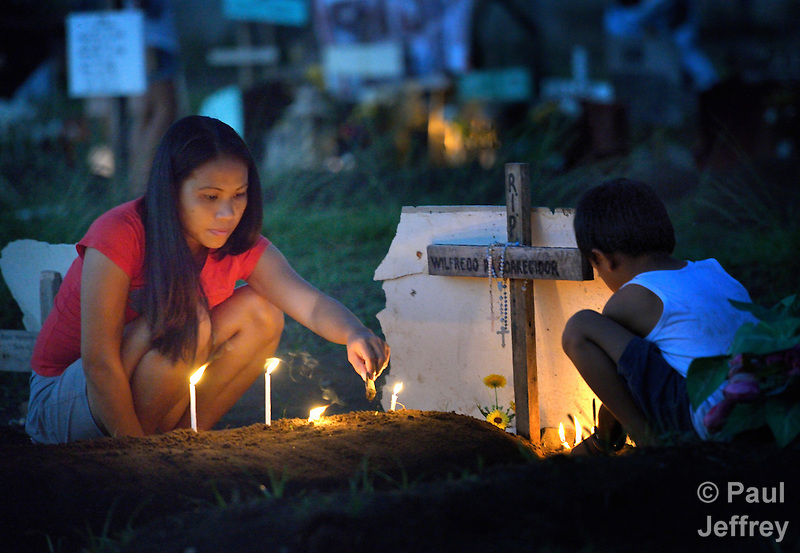 Before heading south to Tacloban and other areas affected by the typhoon, I spent a few days in Manila working on stories, including one about the Manila North Cemetery. Thousands of poor families live there, dwelling in and between the tombs and mausoleums of the city’s wealthy. They are often discriminated against, and many of their children don’t go to school because they’re too hungry to study and they’re often called “vampires” by their classmates. Thanks to support from United Methodist Women, a Philippine NGO provides classroom education–and meals–to kids from the cemetery at a nearby United Methodist Church. 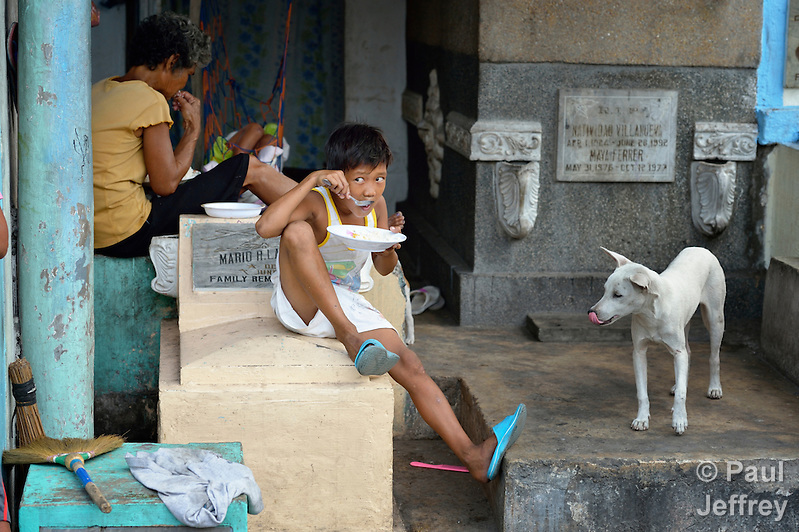 I had the privilege of documenting life in the cemetery. But since city officials don’t think it projects a proper image of the country, photographers are banned. So cemetery residents had to smuggle me in over the back wall, using small stairways inside people’s homes. And here is one of the cemetery girls, in class in the nearby church. To me the cemetery community’s experience is a strong reminder of how we as a faith community believe passionately in life before death. 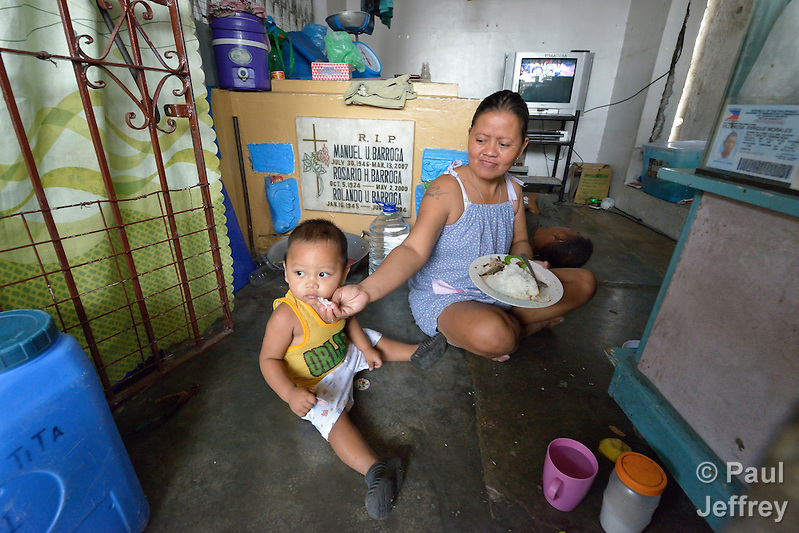 March 1, 2014 | Filed under Asia, Blog, Children, Disasters.